Naga Siren has gained a lot of popularity in a short time, especially since becoming one of Dota Pro Circuit power Newbee’s key heroes. Naga Siren’s main skill allows her teammates to nail huge wombo combos and has led to her becoming one of the most feared heroes in the right hands and one many hope to be rediscovered. Naga Siren was picked by several teams in ESL One Genting 2018, but Newbee was the team that really brought the hero to the main stage. The TI7 runner-up defeated the TI7 winner Team Liquid by pairing Naga Siren with Disruptor in two out of five games. In the other 3 games, Naga Siren was banned in the first phase twice and picked once by Team Liquid. Song of the Siren is by far the skill that stood out the most out of all her skills and is the primary cause of her popularity. This 1000/1200/1400 range sleep doesn’t let her teammates damage their enemies, but the duration is usually more than enough for her teammates to prepare wombo combos to unleash when the enemies wake up. Newbee used the voice as the set-up to get several enemies trapped by Disruptor’s Static Storm. One week later, StarLadder i-League Invitational Season 4 was up and Naga Siren could be seen setting-up for Black Hole and Meteor Hammer as well. 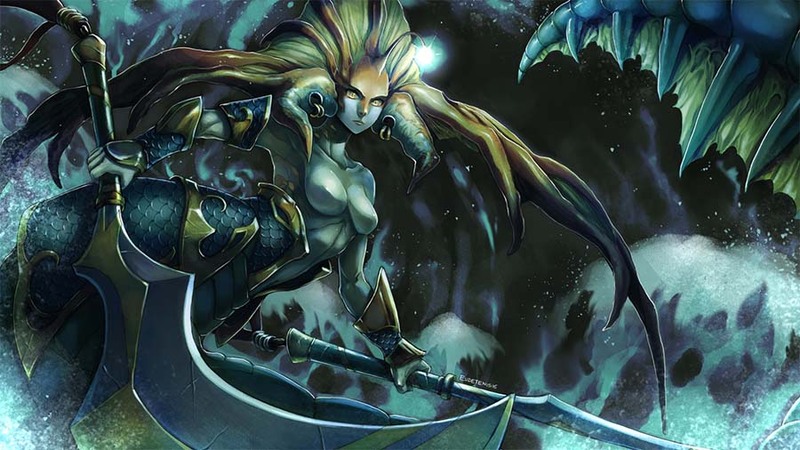 We didn’t get to see Naga Siren in action often, but that was because she got banned frequently. Her other skills are also very valuable in the right situations. An enemy with an active Black King Bar isn’t always bad news for a microphone-holding Naga Siren. Although Song of the Siren doesn’t affect them, Ensnare does. A well-timed Song of the Siren can put all enemies except one to sleep and that one remaining can be hit like usual. Even if that one is trying to run away, Naga Siren can catch them with Ensnare. Ways to catch spell immune enemies outside are rare in Dota 2 and there are no items that can do that outside melee range. This makes Ensnare a very powerful skill by itself, and its synergy with Song of the Siren can seem too powerful in some situations. Naga Siren’s Riptide deals damage and reduces armor at the same time and while Tidehunter’s Gush does the same, Riptide is an AoE skill while Gush is not. Of course that doesn’t mean Riptide is superior to Gush in every way. Gush also slows down the enemy, and with Aghanim’s Scepter Gush knocks enemies back as well. Riptide isn’t that neat, but if you remember Ensnare, Naga Siren does have a neat combo. Another weakness of Riptide compared to Gush is its short range. Using Mirror Image does solve that, but it is often not worth taking Mirror Image early. It increases the mana needed for the hero to perform her combo, in early levels it is less likely for big wars to happen so it is not too dangerous for Naga Siren to come up close. Mirror Image + Riptide combo shines in the later phase of the game. With good micro skills, the nuke can hit many heroes at once. Naga Siren was a hard carry and there was no big change or rework that made her no longer viable. There might be reasons why professional players prefer other heroes as their core, but seeing a core Naga Siren is becoming more common. Picking multiple role heroes early is a drafting strategy that is used in the professional scene. There must be one day when a supposedly support Naga Siren got changed to a core Naga Siren in the drafting phase just to counter the enemy pick. Offlane is the position that we generally don’t expect Naga Siren to be in. However, we are in an era that allows occasional offlane Pugna, Zeus, and Razor. Welcome to 2018. Offlaning those heroes was already a thing in 2017. It can’t be impossible for Naga Siren to be played in the offlane. This hero has the potential to solo the offlane. If one Spirit Bear can pull enemy creeps from behind their safelane tower to its offlane tower, three Mirror Images should be able to do it too. Image duration is 30 seconds, that is enough time to pull. Initiators are often offlaners so having Song of the Siren justifies Naga Siren in the offlane. Besides that, Song of the Siren is basically enough to justify that hero being picked for any position due to how useful the skill can be. Unfortunately, the strength and potential of the Grande Mermaid leaves us one question: will she get nerfed? If we see more teams pick Naga Siren and nail unavoidable wombo combos or if we really see Naga Siren picked in other positions as well, it is likely for the hero to be nerfed. It will be tricky to nerf Song of the Siren. The skill concept itself is already powerful and there aren’t many numbers in the skill that can be nerfed. Cooldown and manacost have numbers that can be nerfed, but nerfing those numbers will lead to less skill usage and as a Dota 2 viewer, I will prefer if Naga Siren is nerfed in other ways because I don’t want less of those wombo combos. I do hope that other skills or the hero’s stats get nerfed instead. If Song of the Siren does get nerfed, I hope only the spell duration is impacted, or maybe just nerf it in a unique way just like how Batrider was nerfed. Batrider initiation used to be so strong that nerfing Flaming Lasso itself wasn’t enough, you also had to nerf the hero’s vision as well.